Panama City administrative offices (City Hall) are located at 9 Harrison Avenue, Panama City, FL 32401; phone: 850-872-3010. 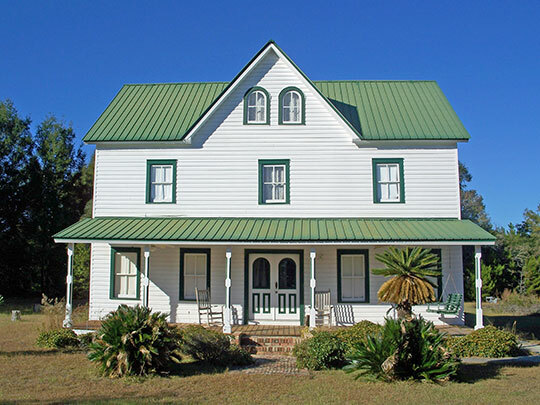 Photo: Schmidt-Godert Farm (Jacob Godert Farm), 100 State Road 2297, Panama City, FL. Listed on the National Register of Historic Places in 2002. Photographed by User:Ebyabe (own work), 2010, [cc-by-3.0 (creativecommons.org/licenses/by/3.0)], via Wikimedia Commons, accessed June, 2014. Panama City, seat of Bay County, lies on St. Andrews Bay, 7 miles from the Gulf of Mexico. The extreme western portion of the town, known as St. Andrews, now a residential section, was a flourishing community in the early 1800s. St. Andrews and Millville, adjoining communities, were merged with Panama City in 1909, and the three incorporated as a single municipality. During the Revolutionary War the surrounding territory was settled by homesteaders, many of them Tories, who established indigo plantations and engaged in lumbering and naval-stores industries. Large catches of mackerel, pompano, redfish, and mullet were salted and shipped until the War between the States, during which Federal troops destroyed the fisheries as well as the salt works. Panama City has grown rapidly since the establishment of paper mills here in 1931. Within a short time a large hotel, office and public buildings, and municipal docks were erected; miles of paved streets were extended to numerous subdivisions in the environs to accommodate paper mill workers; wharves and fish packing and shipping plants along the waterfront were enlarged. The harbor, from 30 to 60 feet deep, is protected by white marble jetties. Here the tide rises but once each 24 hours, because of the landlocked bay and flow of Gulf waters. Six transoceanic ship lines make the city a port of call, and the average annual tonnage exceeds 140,000 gross tons. Fort Harrison Avenue, the main thoroughfare, terminates at the bay in a semicircular park, landscaped with tall cabbage palms. A long wooden pier in the park is used by the deep-sea fishing fleet which makes daily voyages into the Gulf and brings back large catches of snapper, redfish, and grouper. Fishing, yachting, and water sports are popular.